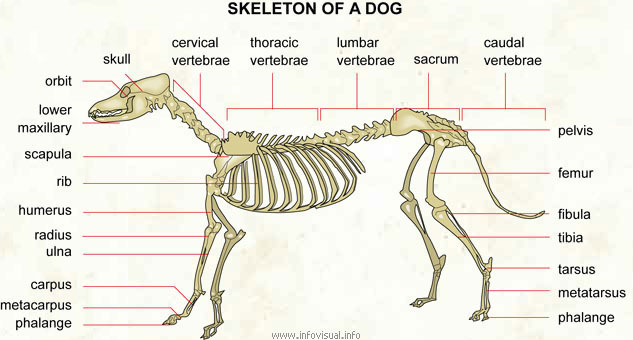 Skeleton of a dog - Visual Dictionary - Copyright © 2005-2016 - All rights reserved. [img]https://infovisual.info//storage/app/media/02/img_en/070 Skeleton of a dog.jpg[/img] [url=https://infovisual.info/en][/url] - [url=http://www.infovisual.info/]Visual Dictionary[/url] - Copyright © 2005-2016 - All rights reserved. Skeleton of a dog: carnivorous domestic mammal raised to perform various tasks for humans. Cervical vertebrae: bones of the neck. Thoracic vertebrae: the bones forming the dorsal part of the thoracic cage. Lumbar vertebrae: the bones of the lumbar region of the back. Sacrum: the set of sacral vertebrae. Caudal vertebrae: bones of the tail. Femur: uppermost part of the rear leg of a dog. Fibula: one of two bones of the lower rear leg of a dog. Tibia: one of two bones of the lower rear leg of a dog. Metartasus: paw bone between the heel and the phalanges. Metacarpus: bone of the paw of the foreleg between the carpus and the phalanges. Ulna: one of two bones of the lower foreleg of a dog. Radius: one of two bones of the lower foreleg of a dog. Humerus: bone of the upper foreleg of a dog. Orbit: cavity of the sjull that contains the eye.